Reasons to Get Botox Other Than Erasing Wrinkles, According to Ernest T. Roman M.D. HOUSTON, TEXAS, USA, April 15, 2019 /EINPresswire.com/ -- When people think of Botox, they often think of relaxing wrinkles. But there are many other uses for the wondrous injectable, in addition to its anti-aging benefits around the mouth and eyes. Here are some of the top reasons to get Botox that may have you headed to the doctor’s office to try it yourself. Botox can act like a nose job, according to Dr. Ernest Roman. “Doctors can inject Botox near the base of the nose to make the nose appear more lifted, which opens up the whole face and takes years off,” he said. “For patients whose noses are sagging, Botox can release the muscle that pulls the nose downward and give the effect of a quick, simple nose job.” For a nose lift without the rigmarole of a nose job, Botox can be a quick fix. Similarly to lifting the nose, Botox injected in the upper lip can push the top lip up and out, giving the illusion of fuller lips. “We have a lot of patients who bring in photos of celebrity’s lips as a reference, but they don’t have a celebrity budget,” Dr. Ernest Roman explained. “Botox is less expensive than typical collagen injections for lips, because it requires just a little Botox.” Dr. Ernest Roman added that the lip lifting effect is subtle, but a little goes a long way in making the face appear more youthful. 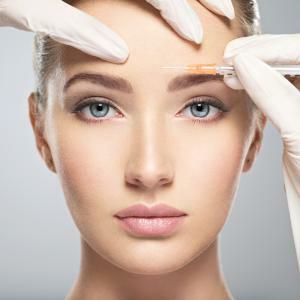 Botox isn’t just for your face. Dr. Ernest Roman uses it as a tool for the neck and décolleté— that’s the upper chest area. Since those spots often get a lot of sun exposure, they can become rough, wrinkled or damaged just as much as the face, if not more. The neck and décolleté can show telltale signs of aging if they aren’t properly cared for. The Botox is injected above and below the lines on the neck and chest, which relaxes them, causing the skin to be smoother. If those lines go down between your breasts, doctors can inject Botox into the pectoral muscles to smooth everything out. The overall effect will be a smoother neck and chest and a more youthful look overall. On a note that has nothing to do with physical appearance, Botox has been approved for relieving chronic migraines. “Doctors are able to inject Botox into the temples on the back of the neck and base of the head,” said Ernest T. Roman M.D. “This relaxes those muscles, which lessens the pain and tension from chronic migraines.” In addition to Botox injections around the base of the head, it can be used between the eyebrows to reduce frowning, which can cause tension headaches and exacerbate migraine pain further.